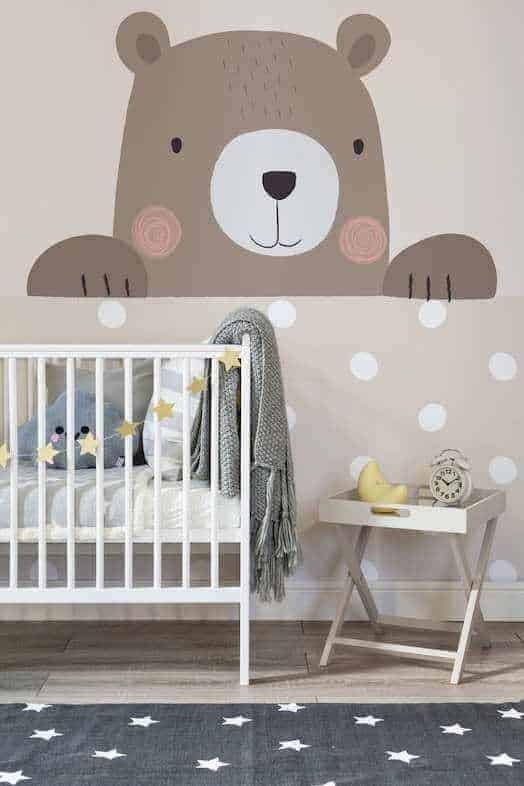 Well today I’m sharing some new Nursery room ideas in terms of wallpaper. 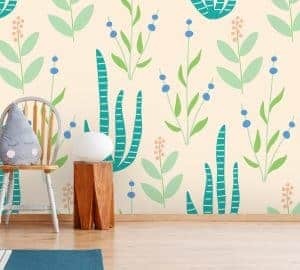 I really do love wallpaper especially cute wallpaper and I love to share fantastic styles and ideas which I find online. These lovely designs are from Murals Wallpaper. I’m not sure what your favourite animal is but for me as a child I always loved Monkeys. I was given a monkey on the day I was born. His name is Monkey George and I still have him 34 years later. 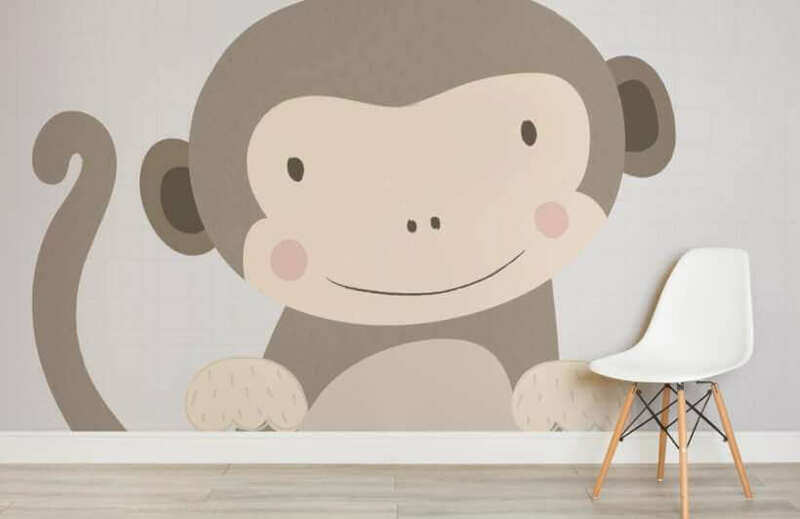 So for me I absolutely love the Maurice the Monkey wallpaper with it’s soft, neutral palette. The Bearnie Bear mural is also cute. I really like the dots in the background. They are not too noisy and create a sweet and stylish look. I can imagine pairing the bear and monkey murals in one room. This could look great. 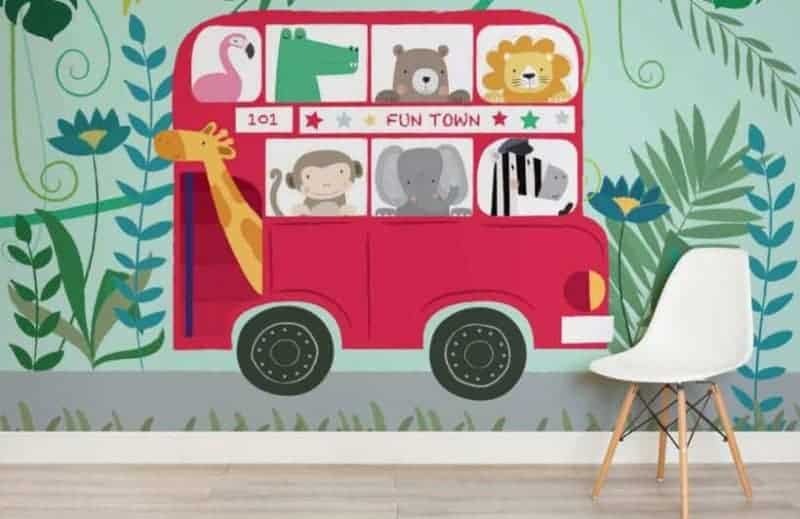 Although I am a huge fan of neutral tones and colours, I am a fan of bright and colourful and so this bus mural featuring all the safari animals and on the fun town bus is a huge winner in my eyes. I could see this in a Nursery room or play centre. This colours are bright and it would add a great pop of colour to any Nursery. 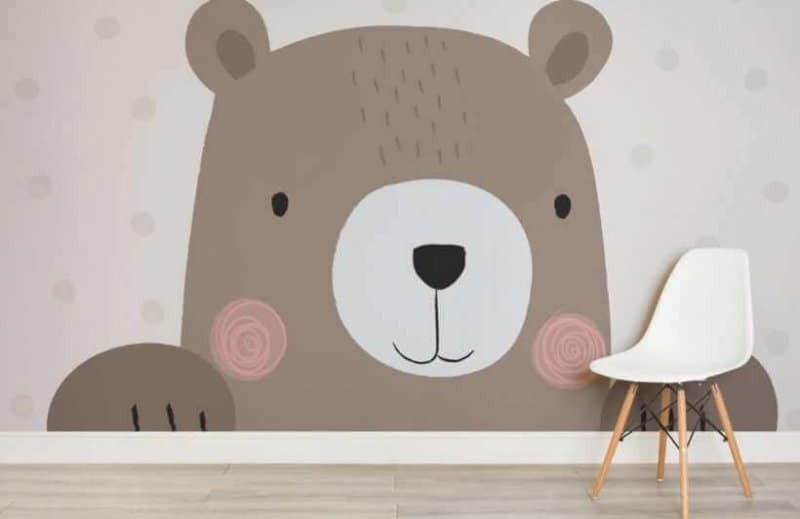 For each adorable critter or animal there are two mural options, either the large wall Mural or the peekaboo mural with shapes below. I really do like Larry Lion and the cute triangle pattern below. 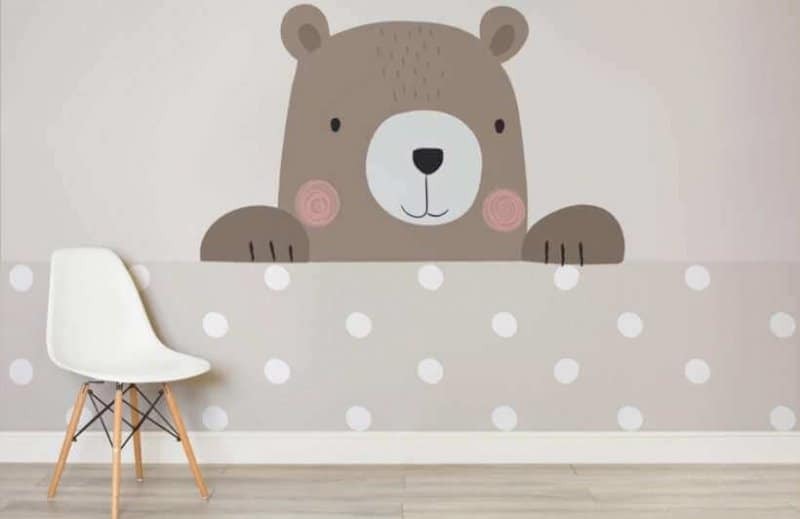 A Peek-a-boo style wall mural could really work well in a home Nursery and the tones and palette would go great with a white cot or cream rug. If your looking for something more girly, you may like to go with Ellie Elephant who had pink tusks. 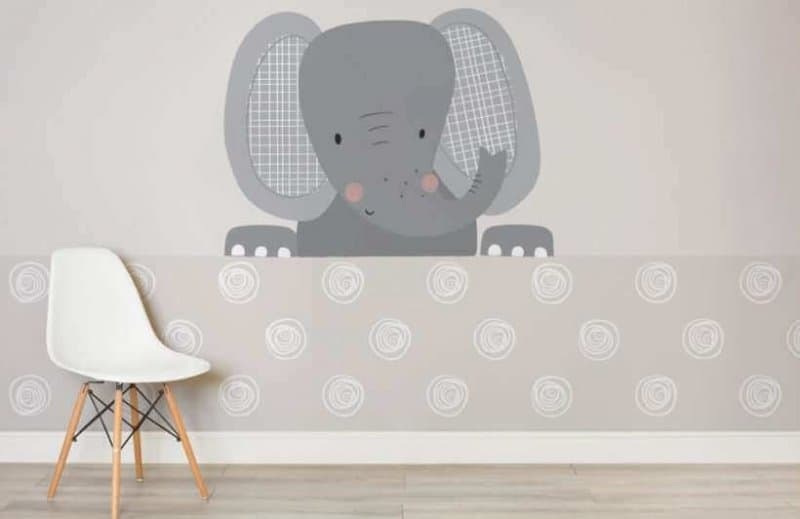 I think the Ellie Elephant wallpaper Mural would go so well with pink bedding and blankets, creating a cosy but dreamy nursery interior. Last but not least is the peekaboo wallpaper option for Bearnie Bear. 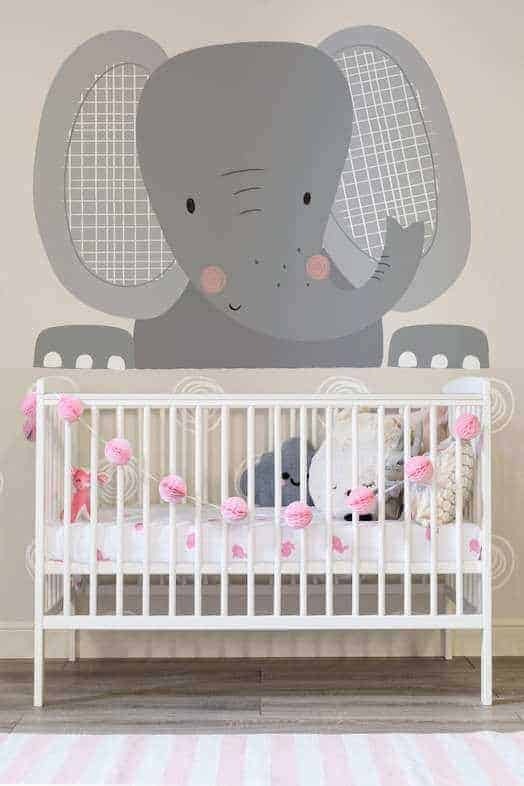 The neutral tones would open up space for a yellow room and this could be ideal for parents wanting to set up a room when your not sure whether your baby is going to be a girl or boy. Yellow is a gender neutral colour and could work well for both boys and girls. So which is your favourite style? 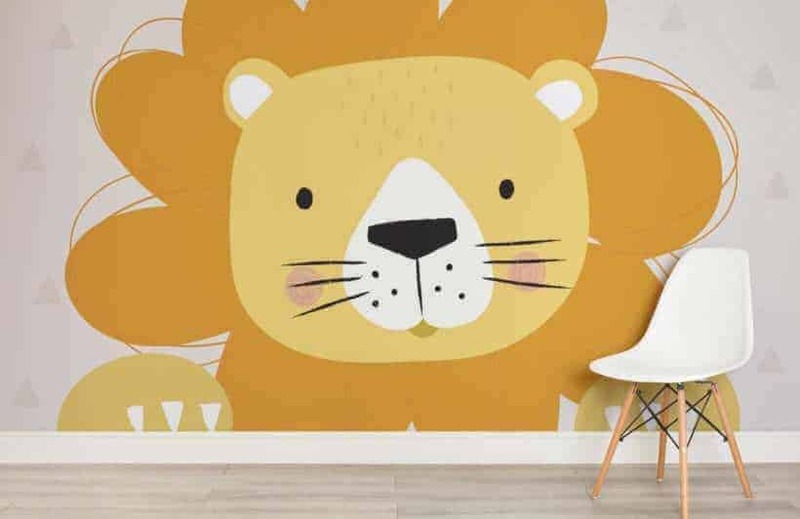 Which wallpaper would you choose for your home Nursery and which for a play centre? I think my all time favourite has to be Ellie the Elephant. This is not a collaboration. 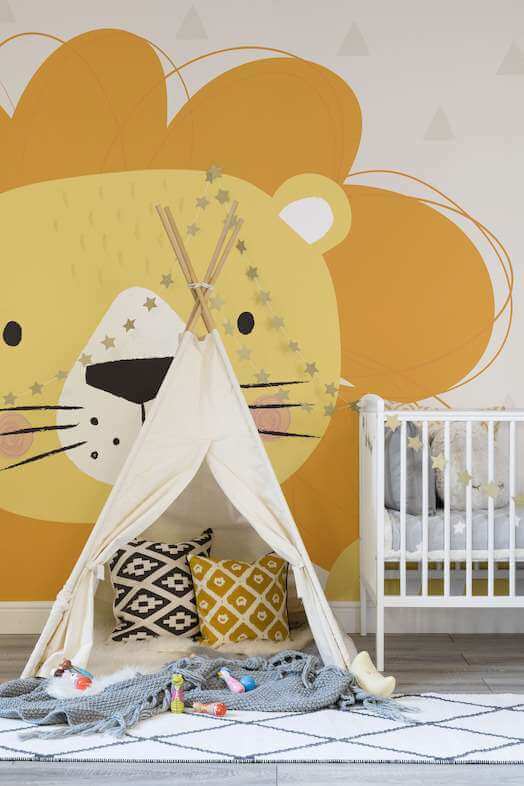 I simply really love the wallpaper and wanted to share Nursery Inspiration here on the blog. Images provided by murals Wallpaper. Oh my gosh, those are the cutest things ever for a nursery. I would love to get the lion or the elephant in the future! thanks. I’m glad you like them! These are such beautiful wallpapers. They are bright and would go well in any kids bedroom. I know my daughter would have liked this as a child. Yes the wallpaper is fab and they are cute too! So pretty! Love that tent a lot, what a nice touch. oh the wigwam is super cute. Love the elephant! So cute. Sweet that you have still got your childhood teddy. 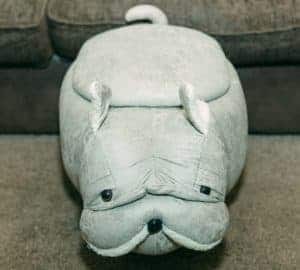 I was given an elephant toy on the day I was born and I still have it too! Yes the elephant one is cute. I like them all, it would be so hard to choose just one! Yes these Mural Wallpapers are a very inspiring idea for childrens nurseries and bedrooms. My favourite has got to be the red bus as its bright and more interesting because of the different characters visible inside the bus. Great! They are lovely and I agree the bus one is super cute. 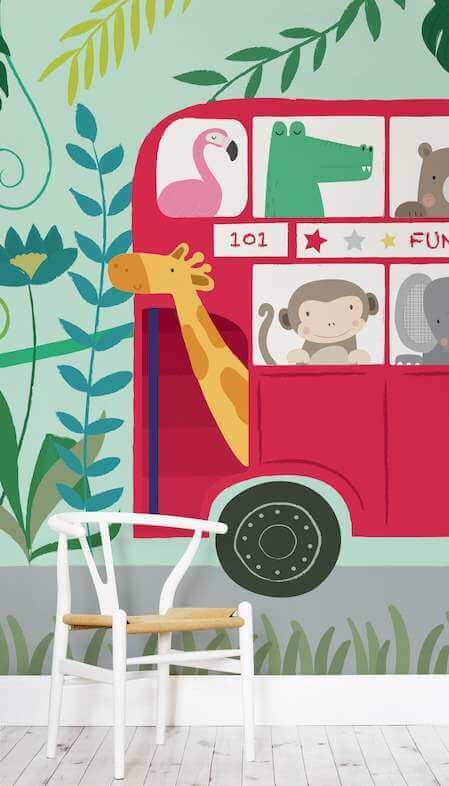 Love these mural wallpaper ideas, particularly the one with the giraffe on the bus. We didn’t have a massive budget for our nursery room so we did most of it ourselves and bought very little. One thing we did buy though were some wall stickers to add the finishing touches to the walls we decorated. We found a great range of nursery accessories which would add some great touches to any nursery! 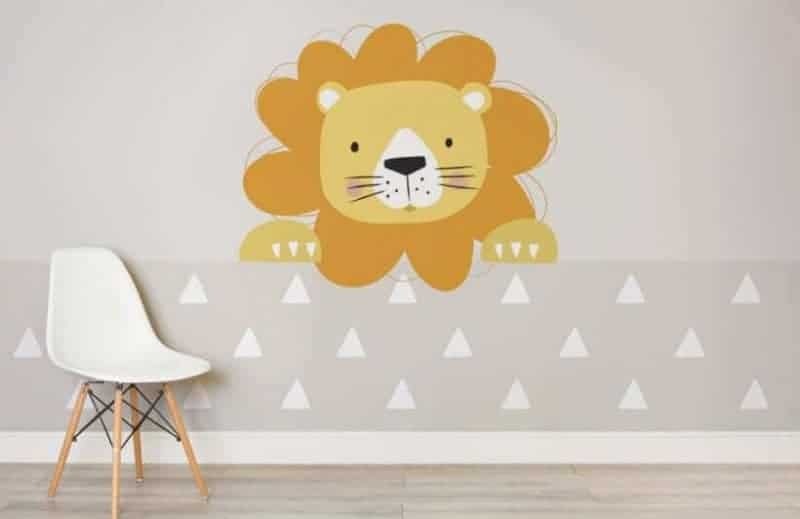 There are plenty of ways to decorate on a budget and I agree wall stickers is one of them! thanks. it is pretty cool!